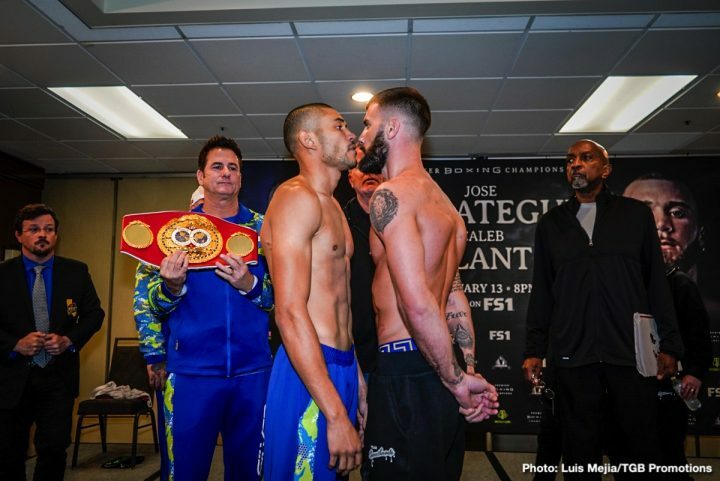 By Mike Smith: Caleb Plant (17-0, 10 KOs) will be challenging IBF super middleweight champion Jose Uzcategui (28-2, 23 KOs) tonight for his IBF 168 title on Premier Boxing Champions (PBC) on FS1 at the Microsoft Theater, L.A. Live, in Los Angeles, California. The televised portion of the card will begin at 5:00 p.m. ET / 2:00 p.m. PT. This is an intriguing fight involving two very different types of fighters. Uzcategui, 28, is an exciting power puncher, who has knocked out four out of his last six fights since 2015, and who could be the best fighter in the 168 pound weight class today. In contrast, the 26-year-old Plant is a light puncher, that likes to win his fights by out-boxing his opponents over 12 rounds. Plant is a crafty fighter without the power to or the will to try and KO his opponents. It’s safe to say that you won’t see Plant standing in the pocket swinging for the fences tonight when he gets inside the ring with the Venezuelan Uzcategui. That would be a big mistake on Plant’s part if he decided that he wanted to mix it up with Uzcategui, because he does not have the power for him to win that kind of a fight. Uzcategui put himself in position to win the IBF title last year when he stopped Andre Dirrell in the 8th round in March 2018. Dirrell quit in the 8th round after taking some heavy punishment in the sixth and seventh rounds. This was a rematch of their first fight on May 20, 2017, a fight which Uzcategui lost after he was disqualified after the 8th round. Uzcategui was in the process of hitting a badly hurt Dirrell with a flurry of shots as the 8th round was ending. Uzcategui got a little carried away and continued to throw punches as the round ended. Dirrell then fell down, and stayed down and the fight was stopped. However, Uzcategui was disqualified for hitting after the bell. Had Dirrell gotten back to his feet to resume fighting, it would have only resulted in a point deduction for Uzcategui. It looked to some fans like Dirrell faked the knockout in order to get a cheap disqualification win. Dirrell did get the win, but it didn’t help him in the rematch that the International Boxing Federation ordered against Uzcategui. Dirrell was worn down by the big punching Uzcategui. The interim IBF title was on the line for the rematch between the two fighters. Last July, the IBF elevated Uzcategui to full champion after James DeGale vacated his IBF belt rather than face him. Plant is a very good fighter, but he would perhaps do better against a lighter puncher like WBO champion Gilberto ‘Zurdo’ Ramirez than he would against the big punching Uzcategui. In Uzcategui’s last fight, he defeated Ezequiel Osvaldo Maderna by a 10 round unanimous decision in his last fight last September. This was a non-title fight for Uzcategui to keep him sharp. He was sick at the time with the flu, otherwise he likely would have knocked out Maderna. Uzcategui was supposed to fight Plant, but the Kentucky native injured and couldn’t take the fight. “I don’t think he looked the best against a lesser opponent. He made a lot of mistakes, and he’s going to have to do a lot better than that if he thinks he’s going to beat me,” said Plant in critiquing Uzcategui’s performance against Maderna. Plant is not short on self confidence. Although he hasn’t done much in his career in terms of beating good opponents, he carries himself like a champion, and he seems to believe that he can defeat any fighter in the division. Plant hasn’t faced a good enough opposition for the boxing public to know whether he’s got the goods to beat a talented young fighter like Uzcategui. On paper, Uzcategui looks to be the better fighter of the two, but Plant is a smart guy, who could pull off an upset if he can find a way to deal with the power and physical skills that the 6’2″ Uzcategui possesses. It won’t be easy though. Uzcategui can do a lot of different things besides just punch. He’s got great foot movement, an excellent jab and very good defensive skills. Uzcategui has improve leaps and bounds from the fighter that lost to Matt Korobov five years ago in 2014. Uzcategui was just a young kid when he was beaten by Korobov back then. The only thing that hasn’t changed in Uzcategui’s game since then is his punching power. Everything else has improved with Uzcategui. It’s going to be awfully difficult for Plant to be able to deal with the power and the punch variety that Uzcategui has going for him. This is a fight that is perhaps coming a little bit too early for Plant. He needs more experience to be fighting a guy with the kind of talent that Uzcategui possesses. It’s going to take the perfect game plan for Plant to win. Uzcategui is going to have too much punching power for Plant in this fight. Uzcategui will pressure Plant and force him to slug. That’s not going to workout well for Plant, who will likely be knocked out by the sixth round. Uzcategui is 100 percent healthy for this fight, and not fighting ill like he was in his last match. Dirrell was able to make it to the 8th because of his incredible hand speed and Matrix-like defensive boxing skills. Plant doesn’t possess Dirrell’s hand speed, defensive skills or talent, so it’s going to be a nightmare for him tonight to deal with Uzcategui’s talent. If Plant fights a safety first style by moving constantly, then he’ll go the 12 round distance lose by a lopsided decision to Uzcategui. But if Plant decides that he wants to slug with Uzcategui, then this fight is going to be over by the third or fourth round. Uzcategui will likely trap Plant anyway against the ropes, and bludgeon him into submission by the sixth round. Plant has a lot of talent, but he’s going up against a much better fighter than himself. It’s too bad Plant didn’t face WBA ‘regular’ super middleweight champion Rocky Fielding before he lost his title to Saul Canelo Alvarez on December 15. Plant likely would have beaten Fielding, as that’s a guy that was made to order for him. In the undercard, talented super featherweight Brandon Figueroa 17-0, 12 KOs) takes on Moises Flores (25-1, 17 KOs) in a fight that promises to be a war from start to finish.